The Land Transport Authority (LTA) announced on Tuesday that it has granted a full-fledged taxi service operator licence to HDT Singapore Taxi. This is after a two-year trial under the Transport Innovation and Development Scheme which involved 100 electric taxis. HDT's business proposal, company organisational structure, past performance records and financial capabilities have demonstrated the company's business viability and ability to operate a full-fledged taxi service, LTA said in a statement. 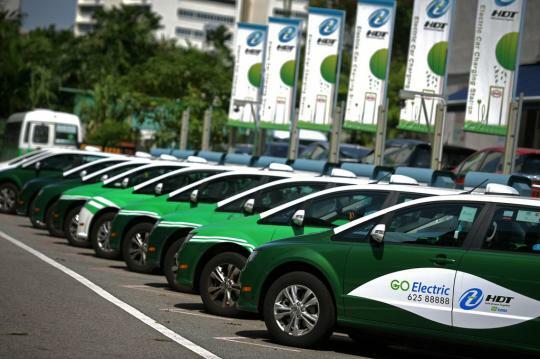 HDT will be required to convert its existing fleet of electric cabs and register them as regular taxis by Aug 31, and will gradually increase its fleet size to at least 800 electric taxis in Singapore within four years. According to LTA statistics, the total taxi fleet stood at 23,140 as of Dec 31, 2017. Market leader ComfortDelGro's fleet numbers 13,244. With the entry of HDT, there will be seven taxi operators in Singapore, including Comfort, CityCab, SMRT Taxis, Trans-Cab, Premier Taxis, and Prime Taxi. As part of its operations, HDT will need to ensure that sufficient charging stations are set up island-wide to support its fleet. HDT will also have to comply with taxi availability and quality of service standards.